The final of the Super League Championship Cup tournament was played on December 15 in Beijing. Heilongjiang, led by Kong Linghui, faced the strong PLA team, led by Ma Lin and Liu Guoliang. The PLA team had won the regular Super League title, as well as the 9th National Games teams event, so it was favored. To get to the finals, Heilongjiang beat Shanghai, led by Wang Liqin, 3-1 the previous week. In that semifinal, Kong upset Wang 3-1 (11 point format used) in the decisive 2nd match. The PLA team beat the strong Luneng team (Liu Guozheng, Zhang Yong and Guo Keli) 3-2 in the other semifinal, with Ma Lin scoring a come-from-behind golden-ball 5th match (played to 11 points). 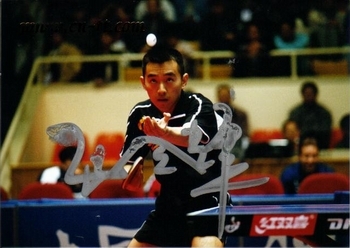 In the final, Liu Guoliang (PLA) first faced Wang Fei (Heilongjiang), and scored a 3-1 win. Then Wang Hao (PLA) played Kong. It was a close contest, with the two players tied at 2-2 after 4 games. Then the unexpected happened: a power outage. Four or five minutes later, power was restored, and the 5th game started. Kong, using his vast experience, won that 5th game handily 11-5 to even the match at 1-1. Ma Lin then played Zhang Pang, and he won 3-1. The doubles team of Kong/Wang Fei proved too experienced for Liu/Ma who lost 1-3. In the decisive golden-ball 5th match, where a single 11 point game is played, Kong drew Ma, and Kong prevailed with a 11-4 victory. 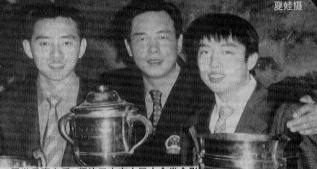 Game, match, and Championship Cup to Kong Linghui and his Heilongjiang team. The top 6 teams from the regular Super League were invited to the Cup Championship. In the first round, Heilongjiang beat Jiangsu and Luneng beat Beijing to advance to the semifinal round. Chiang Peng Lung did not play in the Cup tournament. Liu Guozheng continued his lackluster performance by dropping a match to chopper Hou Yingchao. Kong has been a very busy man lately. A special Kong Linghui pictorial has just been published, and he was in Beijing promoting it. The picture above is from the poster that comes with the pictorial. He is now fully recovered from the flu and the subsequent coughing he has been suffering since the Korean Open, and is now training regularly with the national team. He has converted to a carbon fiber blade that is 5-6 grams heavier; that has increased the power of his shots. He said that he is committed to play in the Austrian Pro-Tour Open in January. His last tournament this year will be in Jinan against the Swedish national team, on December 22. Photos from the final here: Page 1. Second from the top is teenager Wang Hao who, according to Ma Lin's coach, has the best reverse backhand techniques on the national team. Wang was the star in the 9th National Games team event. In the 3rd photo, Wang Tao is reading the December issue of Table Tennis World. In the bottom photo, the 1st man from the left is Kong's father who coached the Heilongjiang club. Page 2 , Page 3 and Page 4 show more photos of the players in action. The woman at the bottom of Page 4 is the assistant editor of Table Tennis World. On December 1, Persson played Wang Liqin in an International Challenge Series match in Chongqing. Wang defeated Persson 4-1 (11-point format). There was a article covering Persson's trip, and here are some excerpts. * Persson and Wang Liqin played for the same French club at one time. Wang was very young, and not very good then, and one of the club member refused to practice with Wang because of Wang's level. How things have changed! That club member is now in jail, and Wang is world-number-1. * Persson marveled at the level of play in China, and the fast improvements of its players. But he said that the understanding of English is still very poor among the Chinese players. "The Chinese players tend to hang together as a group when they are outside of China. They seldom communicate with other players, and they could not improve their English that way. Any one of them will be lost if he is all by himself. Even though English is very different than Chinese, one should be able to use it if one spends the effort. Kong is OK with English, and Ma Lin can get by, too. The others, like Wang Liqin and Liu Guoliang, plus Yan Sen playing in Japan, I like very much to talk to, but....", Persson said. When he was told that Wang Liqin is working hard on English, Persson said that he would test Wang. On the plane to Chongqing, Persson did test Wang's English, but in front of everybody, Wang was shy and did not talk much. Persson told Wang: "It is important to practice English. I will get you an English magazine next time. Even though you spend a lot of time training, you still should have enough time to learn English. It is harder when you get older, so do it now." Wang nodded his approval. In Chongqing, in the training room, the two of them actually talked a little, and Persson said later than Wang's English has improved quite a bit. * In the morning practice, Persson was working together with Niu Jianfeng. Persson quickly found out that Niu had excellent fundamentals and great speed. Afterwards, Persson said that he wanted to play mixed doubles with Niu in the 2008 Olympics, and that the two of them would be invincible. * Persson had been bothered by a back injury, and had not trained normally for over a month. He arrived in Beijing two days earlier to start practicing. Before the match, he asked Xu Shaofa to be his coach. He did not receive Wang's serves well, and quickly lost the first two games. During the break, Xu told Persson: "First, stand back a little, and not too close to the table. Second, try not to let Wang use his forehand. Use your own excellent backhand against Wang's relatively weaker backhand. Third, when you receive, don't try to drop short all the time. When you are unclear about the incoming serve, try returning long. Fourth: try to move quicker". But Persson still made too many mistakes and lost the 3rd game. He told Xu that he knew he had to move fast, but he could not get his feet and his hands to follow. Xu told Persson to calm down, and that if his backhand did not feel right, then try to gamble with his forehand. Persson struggled hard to win the 4th game. But against Wang's forehand, Persson could not continue his limited success. He lost the last game and the match. Afterwards, Persson said that he wanted Xu to be his coach next time, and that he promised to do better. * Even though this was only a challenge match, Persson was unhappy about his performance. He came to China with several friends who saw the match on TV, and they called him to encourage Persson to do well next time. They said that the exhibition match Persson played with a Chongqing youngster was great to watch. After talking to his friends, Persson felt better, and said that when he gets back to Sweden, he would find a doctor to look at his back problem so that he can get back to serious training. "Please call the health club for me, I'll start training tonight", he said. * Since the Osaka Worlds, Persson had not played for Sweden, and he did not intend to play in the Sweden-China challenge match on December 22. Many thought that he had retired from the national team. Persson said, "The matches in Japan are very tiring, and I also want to spend more time with my family. That is why I have not played for Sweden this year. I definitely will play in the 47th Worlds for Sweden. I want to stay in shape and be able to compete in the Athens Olympics". * In Beijing, Persson met ITTF President Sharara at the hotel. Sharara was in Beijing to announce the Sweden-China match, and he expressed his regret that Persson would not play in that match. * The 11-point format was used in Chongqing. 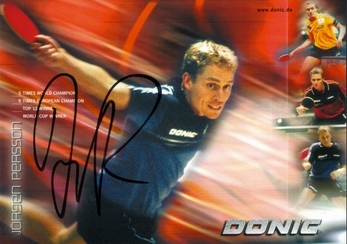 Persson said that he understood ITTF's intentions, but he preferred the 21-point format. "21-points is like a battle. Prior to 10 points, you are carefully gathering input. From 10 to 15 points the battle starts, and after 15 you have the final showdown. The 21-point format tests the intelligence, courage and techniques of the players. In the 11-point format, the final showdown starts right away. Even though you still need skills to win, it is more like a gamble. Nevertheless there are some advantages to 11-point. Since we cannot have the best of everything, I will have to positively adjust to the new format", he said. If Yin Xiao is like a father to me, then Cai Zhenhua is somewhere between a father and an elder brother. He is younger than my father's generation, yet older than my generation. Sometimes he is like a father, and sometimes a brother, and that is also how I treat him, although maybe with a little more respect and deference. Kong and I are on very good terms with Cai. In 1991, the very first day when Cai became our head coach, he moved us from the youth team to the main national team. From then on, we worked hard together, rising from number 7 in teams in 1991 to today's number one. Over these years, Cai has been a very demanding coach. He told us, the younger players, that the team's revival depended on us. We all felt the heavy burden. When we were at the lowest point, Cai had shared with us the great pain, and then later the great rewards. We trust and understand each other, and we finally reached the summit. As a leader in the national team, he should have no regrets. Cai's style is that if he thinks you have a future, he will be very strict with you. On the other hand, if he is loose with you, that probably means that he is not very hopeful about you. I remember in the 1996 winter training, he got impatient with us, and especially me. "The whole coaching team, including myself, have spent more energy on you than on anyone else. Now we are close to the Olympics, and you still are playing so poorly. You have really let us down", he told us. Because of my very specialized techniques, I faced great difficulties. That was a critical juncture in the development of these techniques, and I depended on everyone else's help. At that time, half of Cai's training diary was all about my training. It was because he had hopes that there is a future in the penholder styles, and that I had a future, that his coaching team spent so much time on me. When he saw that I was not doing well, naturally he was very upset. As we grew older, Cai's approach towards us, the more senior players, has changed. I think that the most successful thing about Cai as a coach is that he has his own methods. He is very different in the way he thinks and the way he resolves issues. When we were young, he was very strict and tight with us; now he is relatively easier. He said that now that we are 25 years old, he cannot treat us like he did 10 years ago. When we were young, the coaches could scold us very severely, and we would still think that we deserve it. Now we would feel hurt, that we have lost a bit of self-respect, and the net effect may be negative. But if Kong or I were to make mistakes, we would still feel a little scared. Cai would not let the fact that we are world champions get in the way of discipline. Cai is a very intelligent coach. In management and in matching up with opponents, he has his unique style. Cai and I are similar in that we both are not very patient; we play with intensity and we can help raise the emotional level of our team. There are certainly similarities in our manners. Kong and I really admire Cai. As a player, he had excellent accomplishments. As a coach, he took a team at the lowest point of its history, and worked so hard to take it back to the top. Outside of table-tennis, he is a very highly respected individual. We try to follow his example, and we learn from him. Now that we have been together so long, we communicate very well with him, and we have come to understand the problems a coach faces. Cai now hopes that besides achieving good results, we could motivate the whole team and act as leaders, so that we can pass the tradition onto the younger players. There should have been a great deal of rivalry between Kong and I: we are from the same generation, and we compete for the same prizes. But Kong and I are like brothers, and a big reason for that is the guidance that Cai and Yin provides us. They are always extremely fair with us; they never show favoritism, and they provide us with a fair competitive environment where we can develop fully. After the 43rd Worlds, Cai told us that he sincerely hoped that we would still treat each other the same way. In managing the team, Cai has strong principles. He will not favor you or give you special treatment because you are a world champion. He wants to give everyone a fair environment to compete in. In research, he is the best coach I have ever seen. In tactics, strategies, and in understanding our opponents, he is absolutely topnotch. He is thoroughly familiar with our opponents. Even though we play a lot against these top players and we are familiar with them, Cai has even finer observations on the subtleties of their techniques and their tendencies. I am constantly amazed by the accuracy of his observations and his judgment. Whenever I have any new ideas, I always talk to him to bounce those ideas off him. Cai is also honest and direct; he hates those who lie. In manners, Cai is fairly serious, so players are a little afraid of him. Although we have been with him for so many years, we still feel a little pressure in his presence. That is probably because he has been strict with us for so long. I clearly remember after our first week on the national team, we were sent back to the junior team. At the time Cai wanted to strengthen our fundamentals, and he demanded that we make a certain number of shots within a prescribed time. Because of my special style, we could not finish that required number of shots, but we felt that we had enough. So when he asked us, we told him that we had made the target. But we did not know that he had been there counting our shots. After he heard us, he immediately called a team meeting, and announced that Kong and I were going back to the youth team. We spent a week or so in the youth team, and then Cai brought us back after he was convinced that we had improved. The next day, Cai was watching us practice, and he again scolded us. After that time, whenever Cai was watching us practice, we would feel nervous. Even now. Cai is known for his discipline. Those players who had left the team for years are still afraid to smoke cigarettes when Cai is around, even though clearly they were no longer coached by Cai. But the impression that Cai has strict disciplines is very deep. Cai is very generous in donating his time and money to, for instance, the Hope project and other out-reach programs to help develop the poorer regions of the country. We have learned a lot from him in this respect. In my heart, he is a great teacher and a great friend.